Stretching 250 km of the coastline of the province of Murcia is on the Costa Calida. The Costa Calida literally means “warm coast". An amalgamation of tranquil retreats and busy resorts this region suits both people looking for brand new property for sale in Murcia as their full-time home as well as those looking for a holiday home and indeed you can find areas that will double up as both! There has never been a better time to look for brand new property for sale in Murcia, with property exceptional property prices, new build property for sale in the Murcia region is being snapped up quickly. The Costa Calida is famous for its microclimate providing warm temperatures all year round (averaging in the high 20s in the summer and rarely dipping below 15°C in winter) with very low rainfall of around 34cm per year. If you are considering buying a modern new build property on the Costa Calida you can be sure to enjoy an outdoor life all year round. Property for sale in Murcia, Costa Calida is highly sought after and here at New Spanish Properties we specialise in offering property to suit every taste and budget. 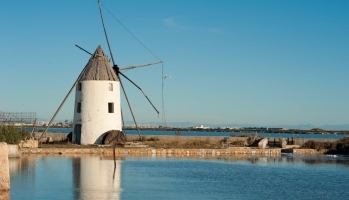 The Murcia region is lush and green, highly fertile region characterised by fields of oleanders, prickly pears and wild dwarf palms interspaced with characterful towns, bustling resorts and old pretty fishing towns. If you are into exploring take a trip beyond the mountains. The Mar Menor, located on the Costa Calida coastline within the region of Murcia is Europe's largest saltwater lagoon, separated from the Mediterranean by a natural breakwater known as La Manga Strip, there are many fantastic new build properties for sale in this area. Without doubt Los Alcazares is the hot spot for current new build property for sale and it is selling quickly. Currently there are some beautiful new build villas for sale in Los Alcazares and modern new build apartments... Some only a 5 min walk to the beach. This “little Sea" is a unique and beautiful area, spanning 73 kilometres of coastline. Here you will find numerous small towns and villages, San Pedro del Pinatar, Lo Pagan Los Alcazares, Los Narejos, Islas Menores, Mar de Cristal and Playa Honda, boasting mile after mile of gentle promenade beaches with numerous bars and restaurants and local tapas bars. Another area offering some excellent new build property for sale in San Pedro Del Pinatar and Lo Pagan. There are some exceptional brand new villas and apartments for sale in Lo Pagan and San Pedro Del Pinatar at unbeatable prices. A beautiful location and a wise investment. The shallow, clear calm waters of the Mar Menor lagoon slope gently to the white beaches and it is no wonder that yet again the Mar Menor flies a 'Blue Flag', with 320 days of sunshine, it is ideal for family holidays and those interested in sailing, diving and water skiing. You will often find people covered head to toe in mud on the Mar Menor bay as it is famed for its natural mud bath which is reputed to have special healing properties for people with rheumatic or arthritic problems. The idyllic picture is completed with Almond trees, palms and windmills, adding to the natural beauty of the landscape of this area. Here the team at New Spanish Properties have been selling new build property for sale around the Murcia region for many years, specialising in new build property for sale in Los Alcazares, San Pedro Del Pinatar, Lo Pagan to name a few locations. 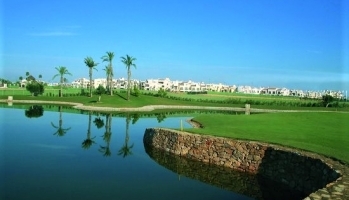 The Mar Menor is still a favourite destination for our team members and their families! Owning a new build property in Murcia, Costa Calida provides you with the perfect base from which to explore many beautiful villages and towns. Cartagena is steeped in history, being founded almost 2,300 years ago, Cartagena has a heritage to rival that of any European city. Cartagena is the perfect place to wander through and absorb its history, the last Moorish stronghold in Spain, the area is brimming with fascinating architecture, including a 13th century church whose remains stand on the steps of a Roman Theatre which dates from the 1st century BC and is one of the most important archaeological sites in Spain. Still a significant naval port, it was here that the world's first submarine was born in 1884 and now displayed on the city front for all to see. In 2009 an impressive new bronze statue appeared on the waterfront at Cartagena. It shows a man with his head downcast and his knees pulled up. The statue is in memory of the victims of terrorism and it was sculpted by Victor Ochoa, it is a striking addition to the city´s modern street art. Apart from its historic treasures, Cartagena is a popular cruise destination and offers an active commercial life, rich culture, a wide range of leisure activities and superb cuisine characterised by locally caught seafood and excellent fruit and vegetables. Murcia was founded in 825 AD by the moors in the centre of the River Segura Valley and has been by blessed with a rich legacy of art and contrasting cultures. Carthaginians, Phoenicians, Greeks, Romans, and Moors have all left their mark on the stunning local scenery. The city, as the capital of the comarca Huerta de Murcia is called Europe's orchard due to its long agricultural tradition and as a fruits, vegetables and flowers producer and exporter. Highlights for visitors include the Cathedral Of Murcia, numerous Baroque buildings, renown local cuisines, works of art by the famous Murcian sculptor Fransisco Salzillo and the Fiestas Primavera (Sprig Festival). Conversely, Murcia is a great destination for those interested in extreme sports, too, with potholing, white-water canoeing, cave-diving, deep-sea diving, paragliding and hang gliding all readily available. As well as impressive shopping, foodies will revel in the huge selection of tapas bars to be found in Murcia's sleepy squares as well as the city's more formal restaurants. Murcia, Costa Calida is a wonderful place to buy a new build villa or apartment. Here there are so many superb, quality new build developments to show you. Book a Viewing Trip today and see all the options that meet your requirements. You won't be disappointed, the brand new properties for sale on the Costa Calida are some of the best in Spain.